Alameda, CA. 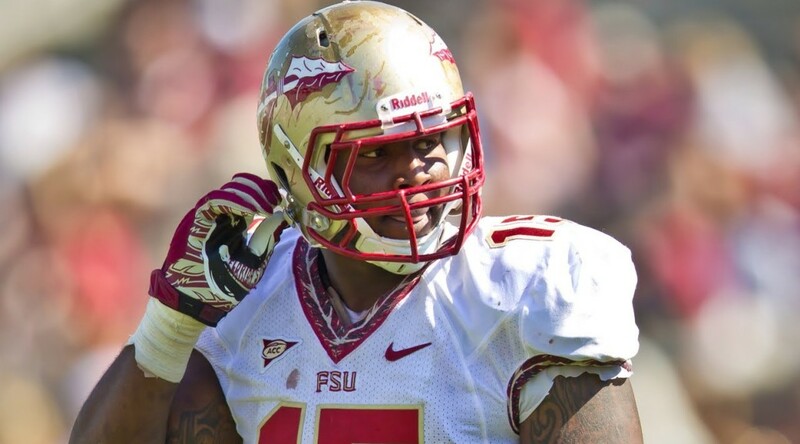 – The past week has been a week of change for Mario Edwards Jr. He was drafted, flown across the country, and today officially began his work on the field with his fellow rookies. In addition to all of the new experiences that have come his way, Edwards was greeted by a welcome change from his time at Florida State – music during practice. Edwards Jr. has only had one practice under Defensive Coordinator Ken Norton, Jr. but he already likes the intensity the former linebacker is bringing to the table. Shawn Jonas : I asked Mario what he thought about Ken Norton Jr’s intensity. After going through the pre-draft process and having every aspect of his game dissected, Edwards Jr. is ready to get to work and just play football. That being said, he’s not forgetting all of the negative feedback he received throughout the process, and is using that to fuel him going forward. Alameda, CA. 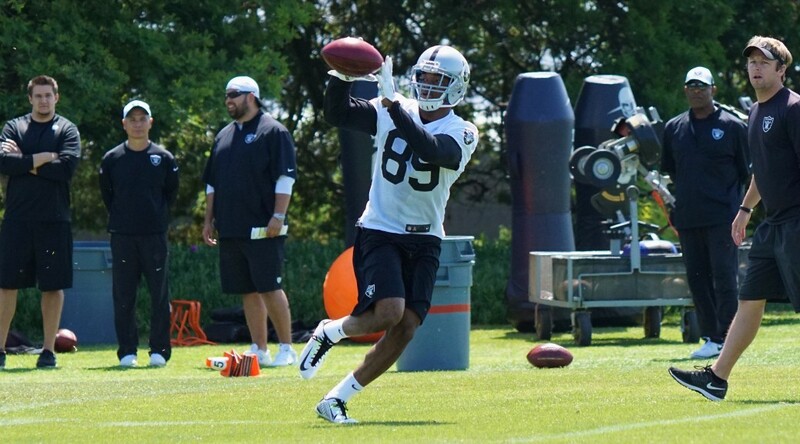 – The number one wide receiver, and fourth player overall in the 2015 NFL Draft, Amari Cooper participates in his first practice as an Oakland Raider. The rookie mini camp session was only a day after he arrived in Oakland and the Raiders also announce the signing of the Highly touted receiver out of Alabama to a contract. 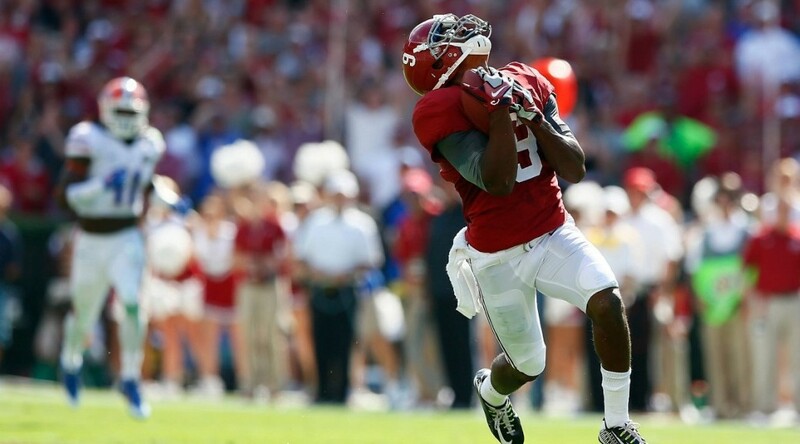 He played three seasons at Alabama, appearing in 40 games and making 30 starts. Cooper left Alabama as the school’s most productive receiver in their illustrious history, setting school records with 228 receptions, 3,463 receiving yards and 31 receiving touchdowns. The 6-foot-1, 211-pounder also ranks near the top of the SEC’s receiving record books in every major category, finishing third all-time in receptions, second all-time in receiving yards and first in receiving touchdowns while helping the Crimson Tide win the BCS National Championship in 2012. As a senior, the Miami, Fla., native was awarded the Biletnikoff Award, given annually to the nation’s most outstanding receiver. He was also named the SEC’s Offensive Player of the Year and finished third in voting for the Heisman Trophy. On his way to being a unanimous first-team All-American selection his senior season, Cooper posted 124 receptions (fourth most by any player from a Power Five Conference in FBS history) for 1,727 receiving yards (Alabama and SEC record) and 16 receiving touchdowns. It was important for the former Alabama wide receiver to get the business part of the game taken care of so he could put all of his focus on football. 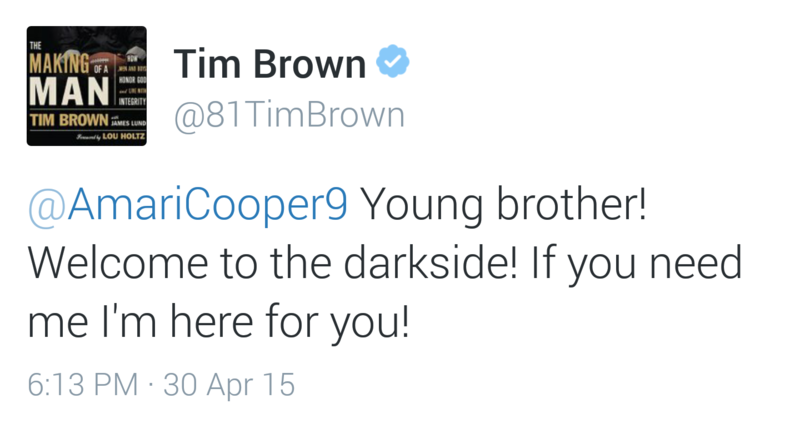 “My agent advised me to do that, so I guess it was important to him,” said Cooper. Cooper participated in a short press conference after his first rookie mini camp session. 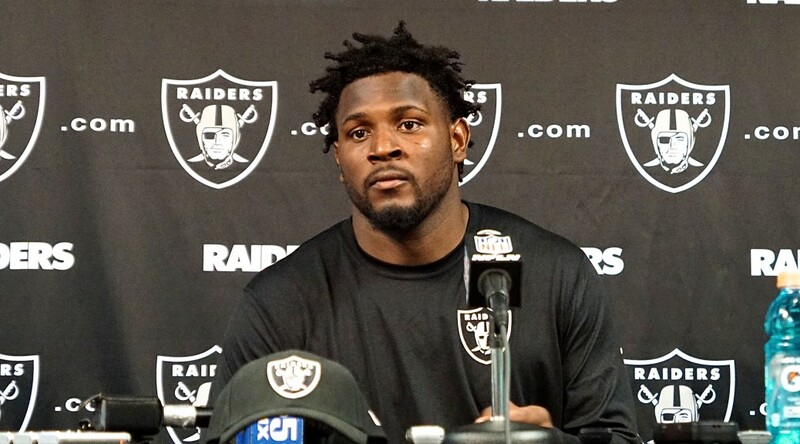 Alameda, California – Fallon Smith of CSN Bay Area broke the news of the Oakland Raiders GM Reggie McKenzie has notified veteran wide receiver James Jones that he will be released. 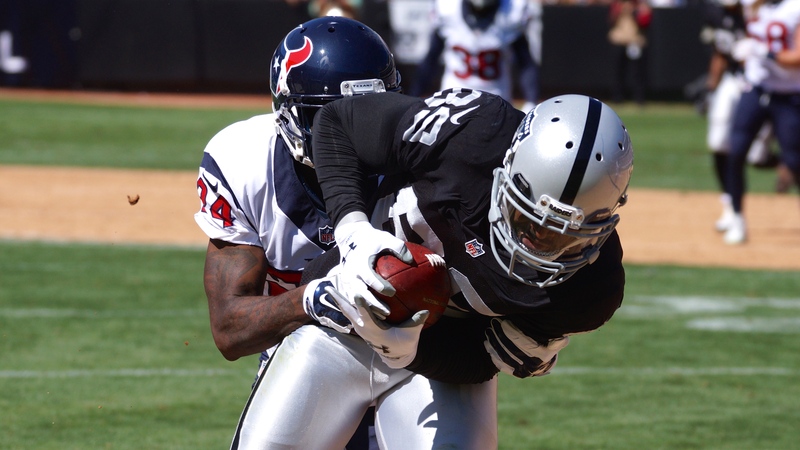 Jones had signed a three-year contract with the Raiders . The move will clear 3.4 million dollars in salary-cap savings and will cost the Raiders no dead money in the move. The 31 year-old James Jones will be entering his 9th NFL season in 2015. The San Jose, California native signed with the Raiders in 2014 after spending 7 seasons with the Green Bay Packers. He attended Gunderson High School and is a San Jose State alum. 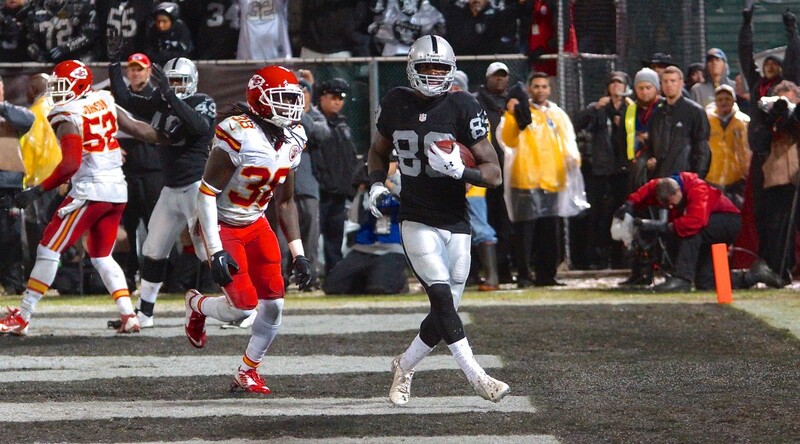 He played all 16 games with the Raiders and had 73 receptions for 666 yards and 6 touchdowns in 2014. His career totals, 383 receptions for 4,971 yards and 43 touchdowns. The Raiders have new found depth at the wide receiver position since signing Michael Crabtree in free agency and drafting the highly touted Amari Cooper with the 4th overall pick in the 2015 NFL Draft on Thursday. The Raiders depth chart looks something like this Amari Cooper, Rod Streater, Michael Crabtree, Andre Holmes, Brice Butler, Kenbrell Thompkins, Seth Roberts, and newly added 7th round draft pick Andre Debose. 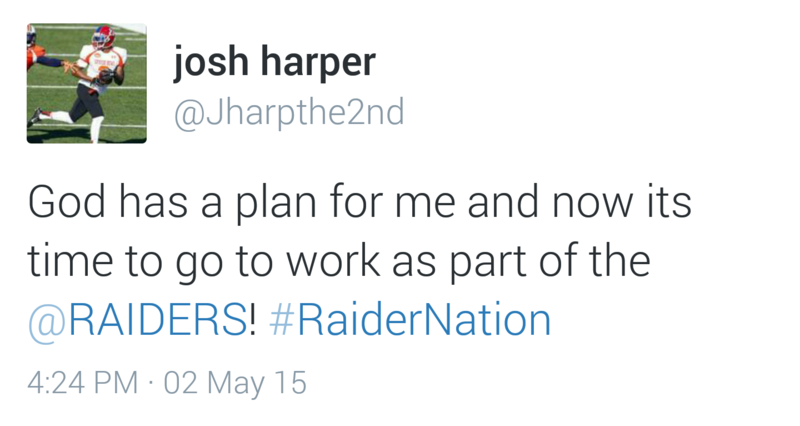 Unofficially, Oakland also signed Freson State wide receiver Josh Harper. 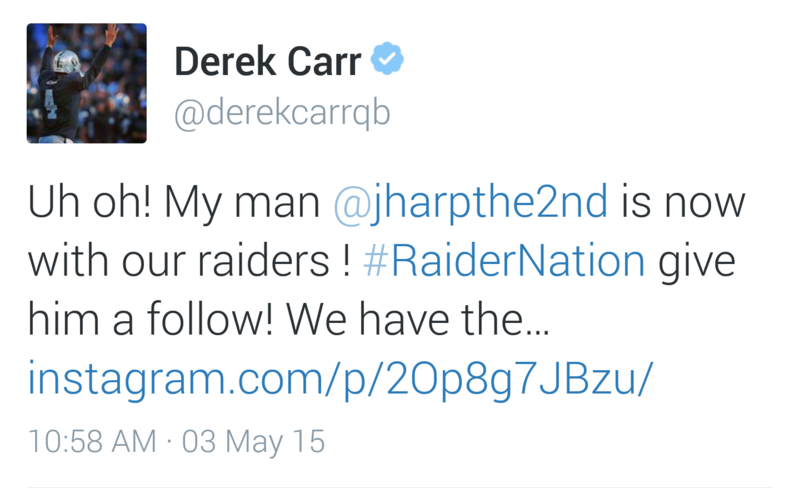 Harper reunites with quarterback Derek Carr. They played together for three years and in Carr’s final season Harper caught 79 passes for 1011 yards and 13 touchdowns. Carr’s other main target at Fresno State, Davante Adams, was drafted by Green Bay in 2014. Harper’s catches went up as a senior due in large part to seeing a larger portion of the passes in 2014 with 131 targets. 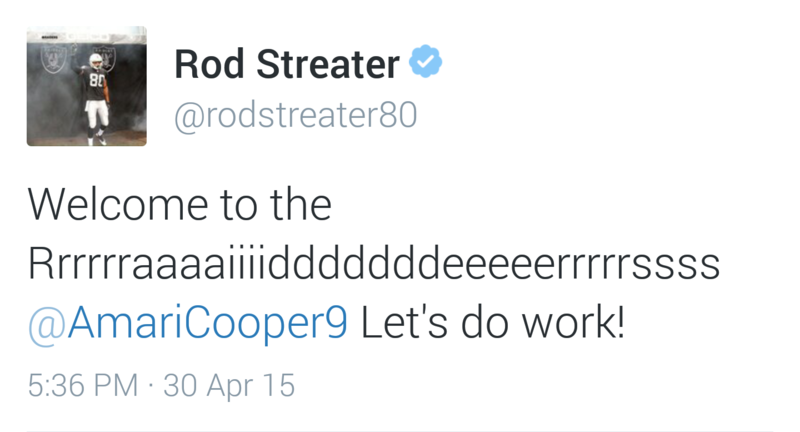 In improving from 79 to 90 catches his receiving yards also went up to 1097. Youth is the theme to this offseason moves for the Raiders and the trend continues with tonights release of James Jones. Reggie McKenzie obviously believes he has his franchise quarterback and he is surrounding him with young talent to hopefully build a winner and go on a nice long run. 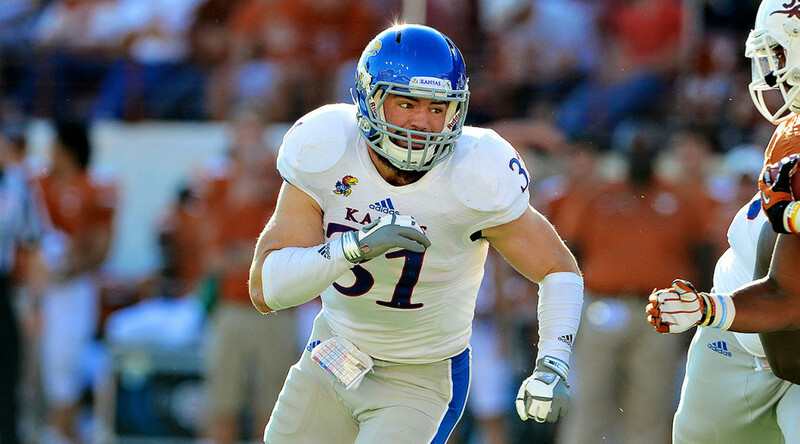 Alameda, California – The Oakland Raiders selected University of Kansas Linebacker Ben Heeney in the 5th round of the 2015 NFL Draft. Ben Heeney 6 foot tall and 231 pounds. He led Kansas in tackles for the last three seasons topping out his senior year with 127. While Heeney is a undersized he plays fast with good speed. Aggressive pursuit angles. His switch is always flipped on the field, displaying a motor that never quits and chasing down plays he has no business being involved in. Smart, instinctive player who read/reacts well, breaking down well on the move. Locks onto his target quickly and doesn’t make many mistakes. Physical wrap-up tackler and throws his body around with toughness to take the punishment. Plays pissed off with a chip and violent, competitive nature. Floats well in coverage to jump passes and get his hands on the ball (eight passes defended, four interceptions in his career). Experienced with man coverage responsibilities and was often the only linebacker on the field, rarely leaving the field. Physical downhill blitzer. Try-hard motor and leaves it all out on the field with resilient mentality. Handled adversity with a handful of different coaches in his four seasons at Kansas (9-39 record over that stretch). 2014 (Sr.): Named Fourth Team All-America by Phil Steele Magazine… Honorable Mention Big 12 Conference Defensive Player of the Year… Selected as a unanimous All-Big 12 First Team honoree by the Associated Press, conference coaches, 247sports.com, ESPN.com, Phil Steele Magazine, Waco Tribune-Herald, FOXSports.com and CBSSports.com… Voted a team captain for the second-straight season… Invited to play in the 2015 East-West Shrine Game following the season… Started all 12 games in 2014… Finished the regular season with 127 tackles, one shy of the conference lead… Led the NCAA and Big 12 in solo tackles with 7.3 per outing…Recorded the 2014 Big 12 single-game high 21 tackles at Texas Tech – 17 of which were solo tackles – marking the second-most in a single game in conference history… Tackled in double digits seven times on the year… Finished his career with 335 total tackles which is eighth best in KU history… He also recorded 35.5 tackles-for-loss in his career which ranks fourth best in the Kansas record book… Opened his senior campaign with a team-high 11 tackles vs. SEMO… Collected 15 tackles, tying a then-career-high, and posted one tackle- for-loss at Duke… Boasted seven solo tackles, two behind the line of scrimmage and a forced fumble against Central Michigan… Totaled 10 tackles, 0.5 sacks, 1.5 tackles-for-loss, one quarterback hurry and one fumble recovery against Texas… Posted six tackles and two tackles-for-loss at West Virginia… Logged a game-high 14 tackles and a sack to go with 3.5 tackles for loss against Oklahoma State… Boasted the most single-game tackles at KU since 1979 and a Big 12 Conference season-high, along with a personal-best, 21 total stops along with an interception at Texas Tech… Logged his sixth double-digit tackling effort of 2014 with 10 tackles and carried the ball once for no gain at Baylor… Garnered seven tackles against Iowa State… Led the field with 11 total tackles against TCU… Contributed nine tackles – including one behind the line of scrimmage – forced a fumble and recorded one quarterback hurry at Oklahoma… Provided six tackles, including one in the backfield, at K-state. 2013 (Jr.): Selected as an All-Big 12 First Team selection by Phil Steele Magazine and an All-Big 12 Second Team selection by the conference coaches, Associated Press, San Antonio Express-News, Athlon Sports and the Waco Tribune-Herald after he finished fourth in the conference with 8.7 tackles per game and ranked fifth in tackles-for-loss per game with 1.15…Played in 10 games, starting all 10 at MLB…Missed the Oklahoma and Baylor games with an injury… Finished with a team-best 88 total stops, including 11.5 tackles for loss and the first three interceptions of his career… Reached double figures in tackles in six of his 10 games played, including four Big 12 contests… Tallied four tackles, all solos, in KU’s win over South Dakota…Credited with 1.0 sack for a loss of four yards vs. the Coyotes… Turned in a career-best 15 tackles at Rice… Also had 2.5 TFLs, 1.0 sack and two pass breakups… Had his first career interception to go along with 10 tackles, one pass breakup and 0.5 TFL vs. LA Tech… Led KU with 12 tackles, including seven solos, in the TTU game… Recorded aninterception for the second-straight game…Also had 2.0 TFLs vs. the Red Raiders… Had two tackles at TCU, including 1.0TFL,beforeleavingthegamewithaninjury…Returned from injury vs.Texas collecting a team-high nine tackles… Led KU with 11 tackles, including two TFLs, and a quarterback hurry at Oklahoma State… Had four tackles, including a TFL, plus an interception which he returned 28 yards in KU’s win over West Virginia… Tallied 11 tackles and one quarterback hurry at Iowa State… Led KU with 10 tackles vs. Kansas State, including 1.5 TFLs. 2012 (So. ): Garnered All-Big 12 Second Team honors by the league’s coaches as well as the Associated Press and Phil Steele Magazine… Started all 12 games at middle linebacker… Ranked third in the Big 12 in total tackles (112) and tackles per game (9.3)… Also ranked fifth in the league in TFLs (12.0)… His 12 TFLs produced a loss of 31 yards… Also had a sack, a forced fumble and two pass breakups… Had five games with double-digit tackles… Made first career start and collected five tackles against South Dakota State… Recorded 12 stops at Northern Illinois… Made a career-high 14 tackles, including a pair of TFLs and a forced fumble, at Kansas State… Had nine stops, including seven solos, against Oklahoma State… Totaled 13 stops against Texas and added a pass breakup… Recorded 13 tackles, incluing a solo TFL and a quarterback hurry, at Baylor… Made nine tackles, including two TFLs, at Texas Tech… Registered 13 tackles, including one TFL, against Iowa State… Collected a career-best four TFLs, including first sack, along with eight total tackles at West Virginia. 2011 (Fr. ): Played in all 12 contests, seeing time on defense as well as special teams… Made collegiate debut against McNeese State, recording two tackles, including one solo stop… Had single tackles against Northern Illinois, Georgia Tech, Oklahoma and Texas… Matched season high with two tackles against Kansas State… One of 10 true freshmen to play in 2011. High School: Ranked as the 12th-best player in the state of Kansas and the 58th-best outside linebacker in the nation according to Rivals.com… Named to the Wichita Eagle’s Top 11 football team… Named 5A first-team all-state by the Topeka Capital-Journal as a running back… Rushed for 2,083 yards and 39 touchdowns on 246 carries as a senior, setting school records in both yards and touchdowns in a season… Ran for a school-record 333 yards against Salina Central… Defensively recorded 143 career tackles, including 14 for loss… Added four interceptions. Personal: Born in Overland Park, Kansas… Son of Joe and Mitzi Heeney… Has one brother… Father and two uncles played baseball at KU… Majoring in liberal arts and sciences. Heeney had virtually no experience at linebacker in high school and didn’t get much instruction there as a freshman, but the new coaching staff saw his potential and he flourished as a three-year starter, leading the Jayhawks in tackles each season. He lacks ideal NFL size and length, but leaves it all on the field and thrives on instincts, playing with a throwback, fierce style. There is a lot to like about Heeney with his play speed and read/react skills to be a hunter, but the body stiffness and average athleticism limit his next level upside. A three-star LB recruit out of high school, Heeney received only two FBS-level scholarship offers (Kansas and Colorado State), but fortunately one was the Jayhawks, his dream school and where his father and two uncles played baseball. A running back in high school, he didn’t see the field much as a true freshman, but earned the starting MLB job as a sophomore in 2012 and led the team in tackles (112), earning Second Team All-Big 12 honors. Heeney missed two games due to injury (knee) in 2013, but still led the team in stops (88) and again took home Second Team All-Big 12 honors. He had his best statistical season in 2014 as a senior, finishing with 127 total tackles and 12.0 tackles for loss, earning First Team All-Big 12 honors. STRENGTHS: Good play speed with fast, aggressive pursuit angles. The switch is always flipped on the field, displaying a motor that never quits and chasing down plays he has no business being involved in. Smart, instinctive player who read/reacts well, breaking down well on the move. Locks onto his target quickly and doesn’t make many mistakes. Physical wrap-up tackler and throws his body around with toughness to take the punishment. Plays pissed off with a chip and violent, competitive nature. Floats well in coverage to jump passes and get his hands on the ball (eight passes defended, four interceptions in his career). Experienced with man coverage responsibilities and was often the only linebacker on the field, rarely leaving the field. Physical downhill blitzer. Try-hard motor and leaves it all out on the field with resilient mentality. Handled adversity with a handful of different coaches in his four seasons at Kansas (9-39 record over that stretch). Productive career — led the Jayhawks in tackles each of the past three seasons, and led the NCAA in solo tackles in 2014 with 7.3 per game. Q: When did you get the idea the Raiders were interested in you? Q: What do you know about this team and this defense? Q: Where do you see yourself fitting best in a 4-3 defense? Q: The fourth-round pick, Jon Feliciano, said he can play all five positions across the offensive line. You can play all three linebacker positions. Did the Raiders tell you they like your position versatility? Q: Now that you’ve been drafted, is it everything you thought it was going to be? Q: From your high school stats, it looks like you were a pretty accomplished running back. Is that what you thought you were going to be later in your career? Q: Did your dad and two uncles all play baseball at Kansas? Did you ever have baseball aspirations? Q: How did that transition from running back to linebacker take place? Q: How much outside linebacker have you played at Kansas? Q: Were you a Chiefs fan growing up? Alameda, California – When day three started the Oakland Raiders originally had pick 102, but traded it to the Carolina Panthers in exchange for pick 124th in the fourth round, 161st fifth round and 242nd seventh round. When pick 124 came up, the Raiders traded back again four spots to 128 and picked up another seventh round pick (No. 218). What started the day as a seven-man draft class the Raiders GM Reggie McKenzie turned into a 10-man draft class. 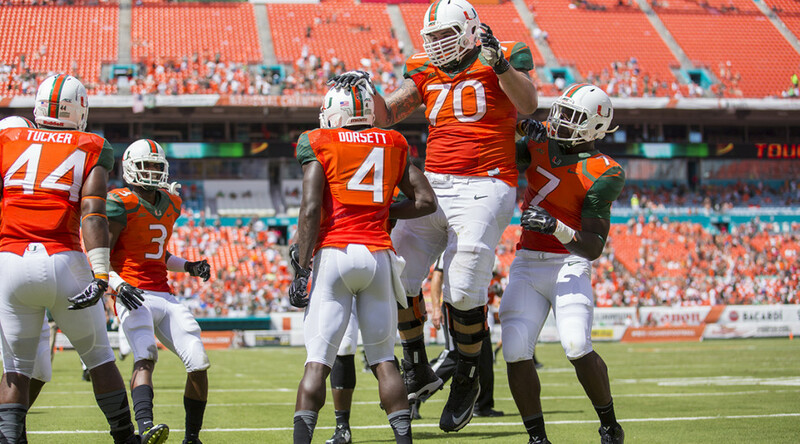 They finally selected Miami guard Jon Feliciano in the fourth round of the NFL draft, 128th overall. The heavy-footed brawler 6-foot-4, 323 pound Feliciano started 13 games for Miami and was an All-Atlantic Coast Conference honorable mention selecteion. The Raiders brought Feliciano to compete at the right guard position with Khalif Barnes and Tony Bergstrom. Coach Jack Del Rio also mentioned the right tackle position is wide open with Austin Howard and Menelik Watson competing. Coach Jack Del Rio has voiced his preference for Barnes to be a swing player available at all positions except center. Feliciano is huge, a hulking man who looks as heavy as his weight suggests. He has a thick lower body and maintains his place against a pass rush. He is a strong run blocker as well, using his size to create lanes for running backs. He doesn’t have great mobility, and might not be a good blocker in space. 2014 (Senior): Started season opener at left guard against Louisville…Made second consecutive start of season against FAMU, paving way for 198 rushing yards…Started against Arkansas State, helping lead offense to 488-yard performance…Started against Nebraska and helped offense generate 435 yards…Saw time at both left guard and right tackle in start against Duke, leading way to 426-yard offensive performance….Started at right tackle against Georgia Tech…Started at right tackle against Cincinnati, helping offense finish with 621 total yards…Helped guide offense to 456-yard performance in road win over Virginia Tech…Started at left tackle against North Carolina, paving way for 494 total yards and 295 rushing yards…Helped lead offense to 492-yard performance against Florida State…Made 11th start of season on offensive line against Virginia…Started season finale on offensive line, leading team offense to 421 total yards…Made final start of career in Duck Commander Independence Bowl against South Carolina, helping lead offense to 422 total yards. 2013 (Junior): Started all 13 games along offensive line … Made 11 starts at left guard and two starts at right tackle … Honorable mention All-ACC selection by ACSMA … Helped anchor offensive line that paved way for Hurricanes offense that averaged 425.8 yards of total offense and 33.8 points per game … Earned letter … Graduated from Miami in May 2014. 2012 (Sophomore): Started all 12 games at left guard … Earned All-ACC honorable mention from ACSMA … Anchored O-line that paved way for third-best passing offense (295.4) and fifth-best total offense (440.2) in ACC … Earned letter. 2011 (Redshirt Freshman): Saw action in 10 games and earned eight starts … Suffered injury midseason but returned to start two of team’s final three games … Finished with overall grade of 84 percent … Allowed zero sacks on season … Earned letter. 2010 (True Freshman): Sat out first season at Miami and participated on practice squad, redshirted to retain eligibility. High School: Three-star recruit and No. 19 offensive guard by Scout.com … Rated three-star prospect by Rivals.com … No. 56 prospect on Bill Buchalter’s Florida Top 100 state list … First-team All-Broward by Sun Sentinel. Q: Where are you? What’s the scene like when you got the news? Q: We’re just finding out some of your back story. You’ve been through so much. What does it mean to you to maybe be able to help your family with an NFL contract? Q: Did you have much contact with the Raiders before? Did you know that they were interested? It seems like a lot of the players didn’t know and wound up being surprised. Q: This team needs a starting right guard. Does that excite you that there is going to be some competition right away and that you may be able to contribute early on? Q: Did you play on the right side or the left side at Miami? Q: Where are you most comfortable? Q: Raiders are big with offensive line with position versatility. That sounds like something that is right up your alley. 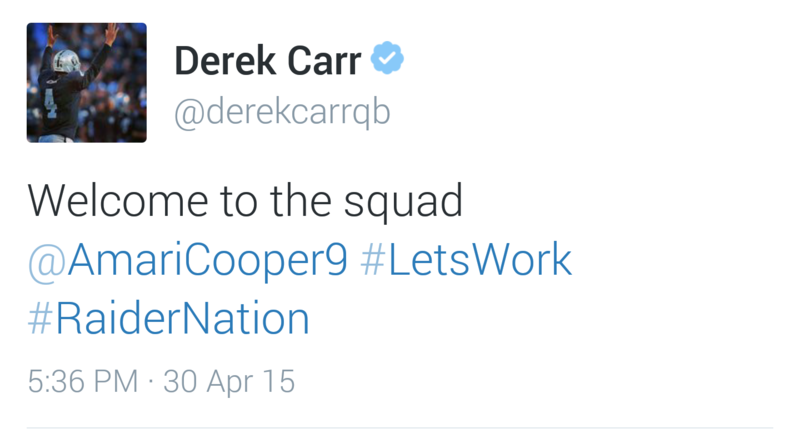 Q: You said the Raiders were one of the teams you were hoping you might end up with. How come? Q: Have you gotten a chance to talk with him already? Q: Have they told you that right guard is pretty much where they have you planned for? Q: At what point did you feel the NFL was a real possibility for you? Q: What is your weight at right now and what do you think is ideal for you? Q: I know Mike Tice likes big, tough guys. Is that what he told you? 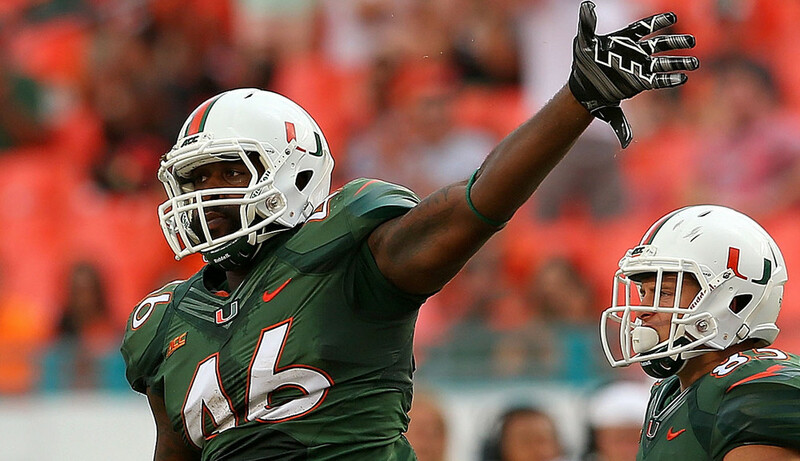 Q: What do we need to know about Clive Walford? Mike Tice likes his guards big, physical and quick, and that’s precisely what he got in fourth round selection, Jon Feliciano. Listed at 6’5” and tipping the scales at 325 pounds, the former Miami Hurricane figures to fit the mold of a Mike Tice-lineman, and will compete for playing time on the right side of the offensive line. Tice is looking forward to spending time with the Davie, Fla., native and the feeling is mutual. The pair met at the NFL Scouting Combine in Indianapolis, Ind., and after speaking with Tice, Feliciano put the Raiders on the short list of teams he wanted to play for. Feliciano’s selection adds depth and competition along the Raiders offensive line, and Tice is pleased to have another student to mentor.